on May 4, 2017, 6:05 p.m. 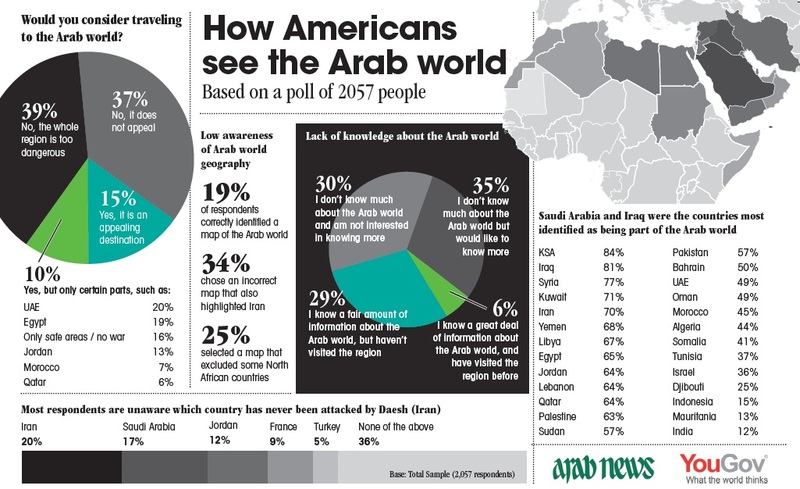 Most Americans have scant knowledge of the Arab world, with eight in 10 unable to point out the region on a map, a wide-ranging Arab News/YouGov poll has found. The survey of 2,057 people in the US revealed an alarmingly low level of awareness about the Middle East and North Africa, but also a desire for more media coverage of the region. More than a fifth of respondents said Agrabah — the fictional city from “Aladdin” — is a real part of the Arab world. An even higher proportion — 38 percent — would be happy with a US travel ban on citizens of Agrabah should they be proven a threat. The US public’s knowledge gap does, however, extend far beyond Disney fiction. The “The Arab Image in the US” poll, conducted March 17-21, found that 65 percent of respondents admitted to knowing little about the Arab World, with 30 percent having no interest in understanding the region further. Over three-quarters of respondents said they would not consider traveling to the Arab world, with 39 percent saying the whole region is too dangerous to visit. The results of the poll are published today to coincide with the Arab Media Forum (AMF) in Dubai. An Arab News panel discussion on “The Arab Image in the West” will be held today, the second day of the forum, to discuss the media’s role in addressing the region’s perception problem. This is significant as a low engagement in news about the Arab world was seen as one factor behind the vast gap in Americans’ knowledge exposed by the Arab News/YouGov poll. Almost eight in 10 of the respondents said they follow international news, but of those only 24 percent tune into news about the Arab world. But half of the respondents said they think US media do not provide sufficient coverage of the region. Stephan Shakespeare, the chief executive of polling firm YouGov, said the findings are significant and a cause for concern, especially at a time when President Donald Trump is ramping up the US involvement in the Arab world. “America appears more isolationist since the advent of President Trump and yet at the same time more willing to intervene fast with military action, defying Russia with a surprise attack in Syria,” Shakespeare said. “Whatever one’s views of these situations, everyone surely hopes for increased understanding between the peoples of the world.” Shakespeare did, however, point to some “more hopeful” signs from the poll findings. For example, when it comes to immigration — one of the key talking points during in last year’s US election — the results were generally positive. The survey found that 63 percent of respondents believe Arab immigrants have made efforts to integrate themselves in US and Western societies.